It wasn't long ago that California public health officials distributed 350,000 Chinese-made canvas lunchboxes to promote healthy eating by school children. Now the state is asking parents to discard the lunchboxes after tests found "significant" levels of lead in some of the canvas bags. The lead was found in only three of the bags tested but officials said they didn't want to take any chances. State bureaucrats are also dealing with charges that they waited too long to notify parents of the hazard. Press reports said that state health officials learned in July that the Sacramento County Public Health Department had found lead in the lunchboxes through a swab test. "It certainly is unfortunate that an item we're using to promote healthy behavior is discovered to be in itself a health hazard," said Mark Horton, director of the Department of Public Health. "We will be reassessing our policy on the distribution of our promotional products." Horton insisted he had acted properly. He said the department stopped ordering the lunchboxes in July and notified local agencies. But Horton's department didn't notify parents until this week. "It wasn't until we got more confirmation tests," Horton told the San Jose Mercury-News, "that we decided to take more aggressive action." "The kind of material we were dealing with required sophisticated testing to determine if there was lead" and if it was a dangerous level, he said. "It took several weeks to conduct the testing." 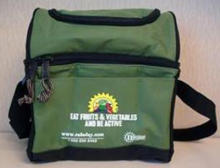 The lunchboxes carry a logo saying "eat fruits and vegetables and be active." They were given out at health fairs and similar events. The lunchboxes were imported from China by T-A Creations, a Los Angeles company. They were then sold to a second company, You Name It Promotions of Oakland, which sold them to the state. It's hardly a sedcret that vinyl and canvas lunchboxes contain lead. New York City and the state of Connecticut have ordered recalls of similar items in recent years and Target and Wal-Mart have pulled some lunchboxes from their shelves. Earlier this year, the Associated Press reported that the Consumer Product Safety Commission (CPSC) was remiss in not discovering the problems that prompted New York and Connecticut to act. The AP story suggested that the CPSC may have hidden the true levels of lead found in the lunch boxes, a charge the agency denied. The CPSC currently portrays itself as short on funds and personnel because of budget cuts by the Bush administration. None of that mollifies California parents and consumer advocates. "It's their mission to prevent illness in children," said Manju Kulkarni, staff attorney for the National Health Law, which works with the California Health Consumer Alliance, "but, instead, they're potentially poisoning them by distributing these lunch bags," the Mercury-News reported.